This type of instrument is used to figure out what a material is by using the light it gives off. This device is also called a spectrophotometer, spectrograph or spectroscope. The DLR Earth Sensing Imaging Spectrometer is mounted on a satellite and is capable of imaging the earth’s surface using near infrared signal. It can measure atmospheric and surface materials. Photo taken by the Edison Tech Center at the 32nd annual Space Symposium. A spectrophotometer is used in chemistry labs to measure the properties of materials. MUSE – Multi Unit Spectroscopic Explorer, this operates at a visible light range close to IR. 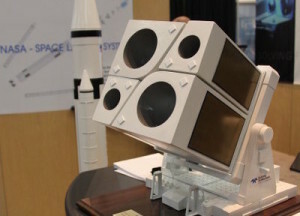 It is mounted to a satellite where it will take images of distant galaxies. This device provides “staggeringly detailed map of the motions and other properties of the observed objects”. More on MUSE helping us discover galactic actions. Now that we have talked some about telescopes, lets see the next page devoted to the subject of imagery from telescopes.